An example of a design project where the placement student worked closely with the designers, contributing to the design development process with their own ideas. 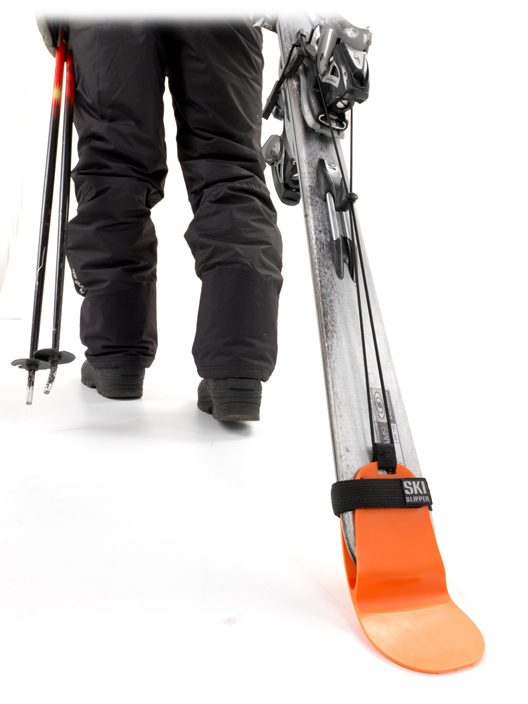 Ski Slipper is a product designed to help skiers carry their skies without damaging them. Internships are one of the most important steps designers have to go through at some point in their budding career. In some cases, it may not be economically viable for a young intern; however, the experience gained far surpasses the short term economic woes. Take 3 months of an intern (or placement) in a busy creative consultancy, in this time a hard working individual will be able to get the good ground knowledge of how a consultancy works, from the process of a design project to the general running of a creative business, not to mention gaining the confidence to participate in a working environment. This article will cover the key aspects for employers and employees when considering placement students. In any business there comes a time when, there is the need to garner fresh blood and new insight. Economically speaking it is not always viable to employ a fulltime member of staff. This is where interns provide the perfect solution for both the company and the individual. However, it is much more complicated than simply “hiring” a new member of staff. There are many different factors to consider when making such a decision. As the employer, the key areas for the business is maintain a high level of creativity and productivity; therefore, the process of selecting a placement or intern is very similar to choosing a full time permanent employee. Creativity – Being creatively practical. Ideas are good, but they have to be plausible or they are just ideas , what can you bring new to the table? Individuality – you have to stand out, for us to notice you. Reliability – Can they be trusted to get work done, to turn up on time and to work on your own. Personality – You could be the best designer ever, but if you don’t fit within the team you can’t be a team player. A sense of humour is good! Commitment – Ability and willingness to improve and to learn new skills and knowledge to help them become product members of the team. Technical ability – Portfolio! Portfolio! Portfolio! As a student there are many different aspects you should consider before undergoing a placement. Often the first though is, “do I get paid?”. Although this is a important factor it should not be the main point to consider. What you gain from doing a placement is the first factor you should consider. The main reason for undertaking a placement is for the experience and knowledge you will gather during your time. This goes hand in hand with the company you are looking for. Will the company you are applying to ,be able to further your studies and knowledge. There is no gain in doing a pointless placement just to say you have participated in one. However you must work with a company that is going to interest you with what they specialize in, or it could be a very long and tedious time for the student. However doing a placement is very useful to a prospective graduate as it will give them further knowledge of the industry, which areas to specialize in for their final year and give them an appreciation of the working environment. It may also help them greatly in their future studies and working life. So in conclusion are placements worth it for both parties? Yes most defiantly so, but only if both sides know what they are getting themselves in for and make the right decisions, for them. About the author: Phil Reilly writes for Wares Design , a product design agency that specializes in innovation. We mix technical expertise with the ability to think creatively. Successful product design is born from an understanding of three main factors: people, markets and technology. With a product design studio based in Sheffield, South Yorkshire, Wares works with clients across the UK and internationally. Our work has developed a reputation for creativity and commercial success. I think internships are great for both parties invloved however…What happens when you spend 3-4 months with an intern, show them aspects of your buisness, how you design, your methodology, etc and then they leave and go work for your competitor? Now your competitor has an employee that you trained and knows your buisness. Internships are the backbone of post-university education, as I see it. I have been in a paid internship in a leading London Design Consultancy for over a month, working on multiple projects from leading brands and generating products and ideas that are original and marketable. Getting thrown in at the deep end to further my skillset has definately helped me to understand the Industry I waited so long to get into. Hey alex good to hear things are going well for you! Internships are great!, and seeing as I co-wrote the article, I am much inclined to agree with you! internships can play a huge role in giving you a competitive edge. An internship gives student and new grads the real-life exposure they need into the corporate world. It gives students a glimpse into any challenges he/she will be facing when they pursue their career. Thank you for sharing this!